You are planning a trip and pull up Google Maps to get an idea where you are headed. Have you ever felt annoying where the links search from desktop need to search for second time on your mobile phone when having on the route? Searching maps from desktop is more convenient, it have larger screens to explore maps on larger and clearly with high resolutions. 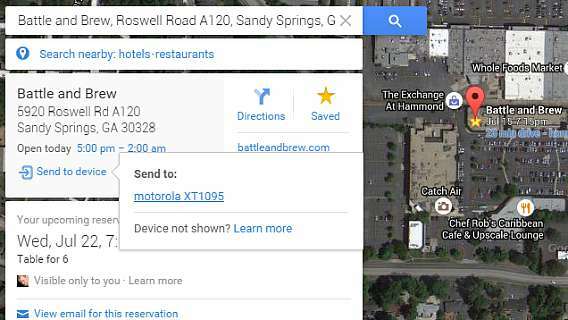 Android users have been calling for a while a new update from Google Maps. Finally Google Maps comes with a new update which supports sending directions from your desktop browser to your Android device. This update will make it easier to fire off directions straight to your Android devices. First of all, you need to have the latest version of Google Maps installed (9.11.0) on your Android devices. Once done installed or update, you’ll need to link up your Android device with your Google account that you have signed in on your desktop or laptop. It works for Chrome, Firefox or Internet Explorer desktop browsers. Now, you will see a “Send to device” option appears at the bottom of the location card in your Google Maps on your desktop. Clicking this option, directions to the location will be sending to your Android device. A notification will appear on your Android device includes option for “Navigation” and “Directions”, so you are able to check the turn-by-turn instructions or just simply review the route. Alternatively, you may tap on the address pulls up the location without automatically loading up a route. From there, you can save the location to favorites, share with friends and enjoy it. Please be noted, for those who use Google Maps in “Lite Mode”, it won’t see the “Send to device” option appear on your desktop even if they have the latest Maps update installed on their device.